Jane Withers is a well-known actress, who, as a child and into her adulthood, made a series of films for 20th Century-Fox. She later became a very well-known pitchman as "Josephine the Plumber" in television commercials for Comet Cleanser. Charming, with a huge, expansive personality, Ms. Withers has several reasons to be sentimantal about the Chinese Theatre. Jane's mother Ruth was a Bible school teacher, who began teaching daughter Jane how to sing and be charming. At age three, Jane began appearing on an Atlanta radio program called Dixie's Dainty Dewdrop. By age six, Jane and mother Ruth had relocated to Hollywood, where Jane worked at being a model and getting bit parts in films. Her big break came when she was cast as the heavy in the Shirley Temple film Bright Eyes (which played the Chinese in December, 1934). Two years older than Temple, Withers was bigger, badder and more horrible than anyone poor Shirley had ever had to deal with. Withers almost walked off with the picture. This suggested that she could carry her own films, which she proceeded to do, beginning with Ginger (which played the Chinese in July, 1935). Although done on "B" budgets and co-stars, Wither's films initially were cast in the same mold as the Temple pictures: young orphans trying to save the old folks from various things. But as the Withers films became more popular, she was allowed to branch out into more slapstick, wacky humor — something which dovetailed perfectly with Jane's personality. Before long, she was one of the top box-office attractions in the country. These films are difficult to track down today, but are well worth taking for a spin: This Is the Life (released in October, 1935), Paddy O'Day (released in January, 1936), Gentle Julia (released in April, 1936), Little Miss Nobody (which played the Chinese in June, 1936), Pepper (played the Chinese in September, 1936), Can This Be Dixie? (released in November, 1936), — that's five films in 1936 — The Holy Terror (played in March, 1937), Angel's Holiday (played in June, 1937), Wild and Woolly (played in August, 1937), 45 Fathers (played in November, 1937), Checkers (played in December, 1937), — so that's five more films in 1937! 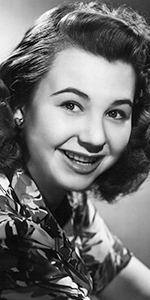 Jane Withers kept at it in 1938: Rascals (which played the Chinese in June, 1938), Keep Smiling (played the Chinese in August, 1938), and Always in Trouble (played in November, 1938) — okay, that's only three for 1938. 1939 brought Arizona Wildcat (played in March, 1939), Boy Friend (released in May, 1939), and Chicken Wagon Family (released in August, 1939). Her next film, Pack Up Your Troubles was playing the Chinese when her Forecourt ceremony was held in November, 1939. At sixteen, Withers entered the 1940s with High School (which played the Chinese in February, 1940), Shooting High (played the Chinese in April, 1940), Girl from Avenue A (released in August, 1940), and Youth Will Be Served (released in November, 1940). 1941 saw Golden Hoofs (played in March, 1941), Her First Beau (released in May, 1941), and A Very Young Lady (played in July, 1941). Young America (released in February, 1942), The Mad Martindales (released in May, 1942), Small Town Deb (played in November, 1942), Johnny Doughboy (released in December, 1942), which is the last film she did for the studio under her original contract. In 1943, she took a supporting role in Sam Goldwyn's The North Star (released in November, 1943), and starred in My Best Gal (released in March, 1944) and Faces in the Fog (released in November, 1944), at Republic (!). She only made one picture in 1946: Affairs of Geraldine (released in November), and one in 1947: the noir picture Danger Street (released in June, 1947). The slowdown was due to Withers getting married in 1947, after which, she more-or-less quit to raise a family. When director George Stevens was planing to make his film of Giant (which would have its Hollywood premiere at the Chinese in November, 1956, and would run there for 10 weeks), he had only one actress in mind for the role of Vasti Snythe: Jane Withers. Withers was dumbfounded at the offer, but her performance in the picture is a true pleasure in a great film. And so, Jane Withers' career was not over. She began to do some guest slots on television shows; in the mid 1960s, Withers met with ad man Milton Gossett, and assumed the role of Josephine the Plumber in a long-running series of television and print ads for Comet cleanser. When Jane laid down the role in the mid 1970s, her neice JoAnn took over. Very popular ad campaign. During this time, Withers did appear on television shows: Bachelor Father in 1962, The Munsters in 1964 and 1966, The Love Boat in 1980, Hart to Hart in 1981, Murder, She Wrote in 1991 and 1993 and Amazing Grace in 1995. She provided the voice of Laverne in the Disney version of The Hunchback of Notre Dame (released in June, 1996), and its spinoffs as recently as 2002. She returned to the Chinese Theatre during the 2013 TCM Festival, where she was interviewed by Ben Mankeiwicz before a screening of Giant on April 27, 2013. Grauman's Chinese Theatre, Hollywood, California. 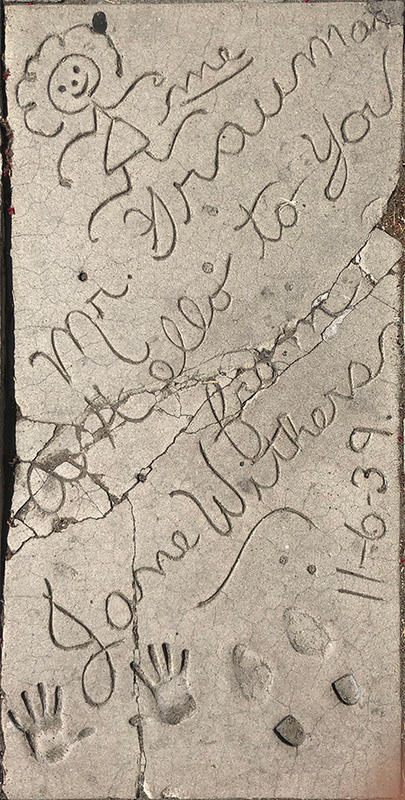 Jane Withers Forecourt ceremony, Tuesday, November 6, 1939. 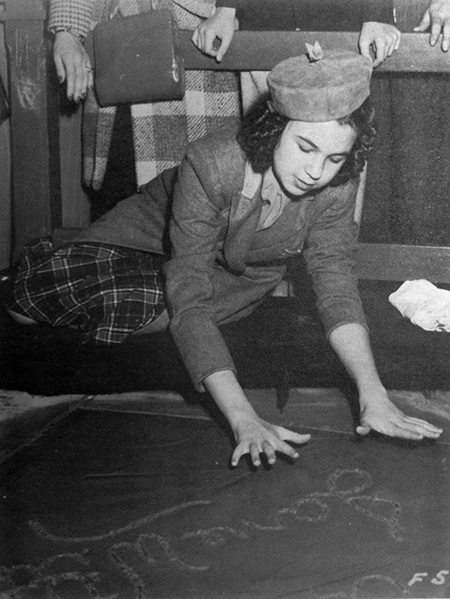 Jane Withers pauses before placing her handprint into the cement. Grauman's Chinese Theatre, Hollywood, California. TCM Festival screening of the film Giant, held Saturday, April 27, 2013. 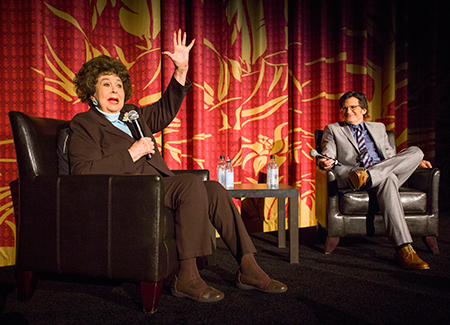 Jane Withers talks with TCM's Ben Mankeiwicz about her role in the film. Photo by John Nowak. TM & © Turner Entertainment Networks, Inc. A Time Warner Company. All Rights Reserved.